Is it actually possible to make it through the winter without someone catching a cold? It's typically more than only one someone, actually. What is it about kids and germs that they're magnetically attracted? Whether they pick them up at school, while shopping, playing outside or elsewhere, they always seem to have a knack for it. As well as covering our mouths when we cough and blowing our noses properly with tissue, one way that we work to at least cut down on the amount of germs spread around here is with a lot of hand washing. Both of my daughters do a fairly good job of heading to the sink themselves, but when it comes to actually scrubbing up, they can always use a little more encouragement. Fortunately, that is much easier thanks to the arrival of the new Deep Cleansing Hand Soaps from Dial. America's trusted brand for 65 years, Dial has continued to deliver clean, healthy skin for families everywhere with their body washes, bar soaps, hand soaps, liquid hand sanitizers and lotions. But while Dial Liquid Hand Soaps have long been known to not only clean your skin but condition it as you wash, they have now introduced a new, luxurious level of hand washing with their Deep Cleansing Hand Soaps. These premium soaps feature vibrant scents, a gentle micro-scrubber formula that smooths skin and provides refreshing moisture, and a completely new design that blends well with any home's style. Nice! Available in three bold scents — Water Blossoms, Coconut Lime Verbena and Yellow Raspberry & Black Sugar — I was ready to give these a test to see how they would compare to our current family soap. Even better, my young testers were more than excited to wash their hands to get the full experience of these great smells! 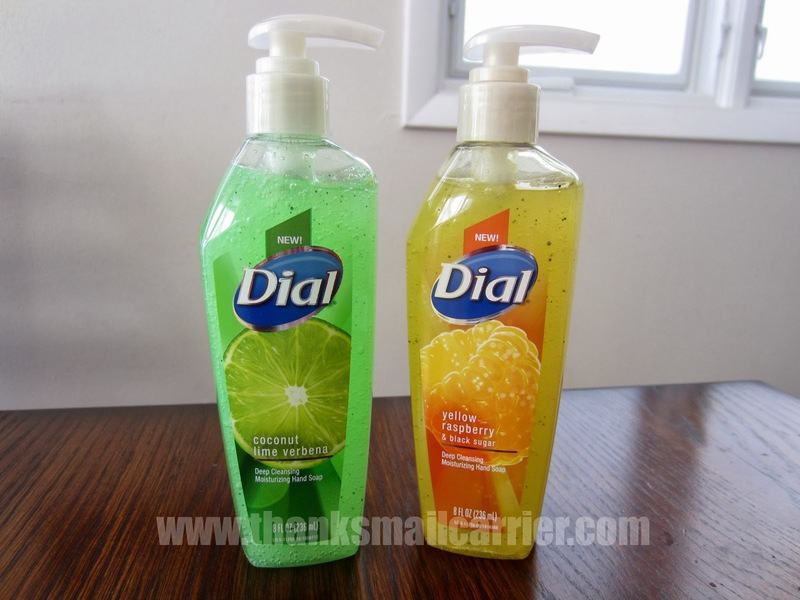 Just as Dial had claimed, we have enjoyed having their Deep Cleansing Hand Soaps in our home and the kids (as well as the adults) have commented time and again about the fresh, vivid scents. The Coconut Lime Verbena has a bright, tangy, juicy citrus aroma, while the Yellow Raspberry & Black Sugar has a tart, rich sweetness that encourages you to take a deep breath while soaping up. The votes for our favorite have ended up split, as Big Sister E has declared Coconut Lime Verbena her winner while Little Sister B and I are a tad obsessed with the Yellow Raspberry & Black Sugar. We may have commented more than once about how it smells so good that it is tempting to want to actually taste it! 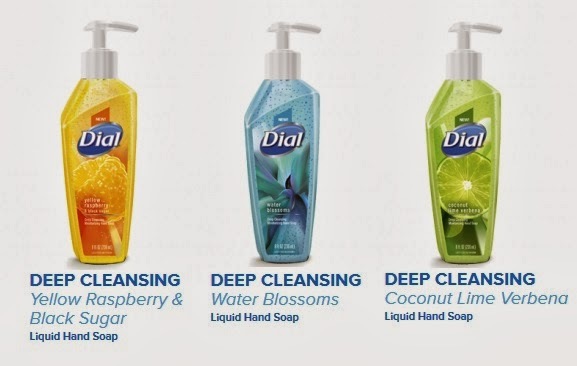 New to stores last month, keep an eye out for Dial Deep Cleansing Hand Soap during your next shopping trip to try this new hand washing experience in your home, too. Find out more about this and all of Dial's great products by visiting DialSoap.com and connecting with them on Facebook and Twitter. for FREE Dial Deep Cleansing Hand Soap! *Note: Coupons expire 3/31/2014, so winners will need to head to the store quickly to redeem them! 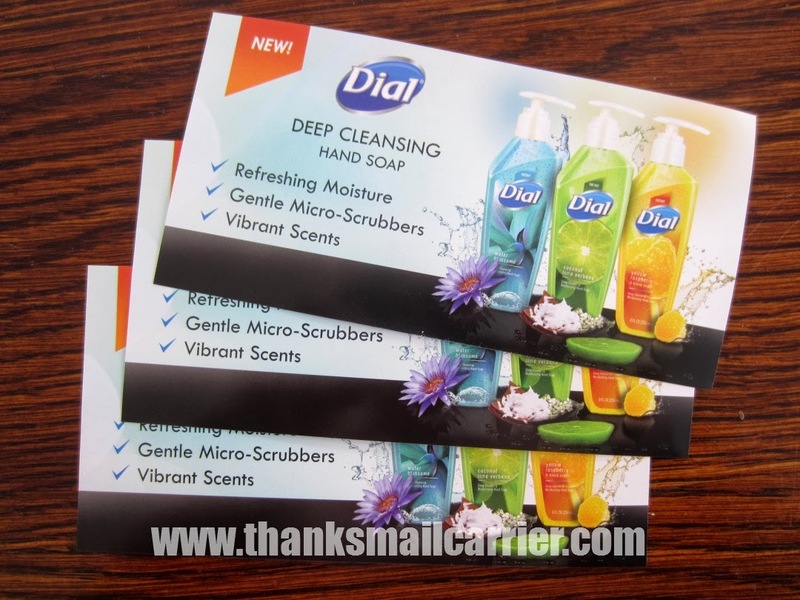 A big thank you to the Dial brand for providing samples and coupons of Dial Deep Cleansing Hand Soap for me to review as well as coupons for three lucky giveaway winners. The opinions shared are my own and honest and if you really need to see more, click here to see how I roll. We have a siberian husky puppy who loves to dig and are always washing our hands and her paws. We'd like to try the deep cleansing water blossoms scent. Besides we all love blue and the water blossom color is the ice blue of Maya the husky's eyes. I want to try the Coconut Lime Verbena scent! I would like to try the Yellow Raspberry and Black Sugar first. I want to try yellow raspberry and black sugar. I would like to try the Water Blossoms scent. Would to try the Coconut Lime Verbena. I want to try the Yellow Raspberry & Black Sugar first. I want to try the Coconut Lime Verbena scent. I would want to try the Water Blossoms scent, first. Not a fan of coconut or lime scents and I have no idea what Black Sugar is. I would try the coconut lime verbena but my family would probably want the raspberry. The coconut lime sound heavenly. I think the water blossoms sounds great. The coconut lime verbena sounds the best. Id like to try that one. I would like to try the Coconut Lime Verbena first. I love coconut, so I'm sure to love this scent. I would like to try the Yellow Raspberry & Black Sugar. Yellow Raspberry & Black Sugar scent sounds nice. I would try Coconut Lime Verbena dial soap. Thank you! I'd like to try the raspberry scent. I'd like to try Yellow Raspberry. I like the coconut lime verbena scent. I would want to try the Water Blossoms scent. the first scent I'd like to try is water blossoms. I would like to try the raspberry and black sugar first. I would like to try Water Blossoms first. Hi! The Yellow Raspberry & Black Sugar sounds heavenly. I'd pick that one first. Thanks! I want to try the coconut lime verbana! I'd try Coconut Lime Verbena first. I would like to try the yellow raspberry and black sugar scent. I would like coconut lime verbena. I want to try the Coconut Lime Verbena. I'd really like to try the Water Blossoms. I would try the Coconut Lime Verbena scent first. I would like to try the Coconut Lime Verbena scent first! I want to try the water blossom. The coconut lime verbena scent. I would love to try the water blossom scent first. The new Dial Deep Cleansing Hand Soap scent that I would like to try first is Water Blossom, thank you. I would like to try the Yellow Raspberry and Black Sugar scent first. I think the Coconut Lime Verbena sounds like it would smell amazing! I would love to try this scent! Water Blossom would be my first choice to try, but they all sound just wonderful! My pick for first try would be Coconut Lime Verbena. I would like to try the Yellow Raspberry and Black Sugar - I haven't tried that scent. I would love to try the Water Blossoms scent first. I'd try the Coconut Lime Verbena first. I would like to try the Coconut Lime Verbena. I'd go with Coconut Lime Verbena first! I'd really love to try that Coconut Lime Verbena Dial first. I'd love to try the Yellow Raspberry & Black Sugar one. yellow raspberry and black sugar. I would like to try the coconut lime scent. I'd most like to try the Coconut Lime Verbena, because it has the sweet tropical coconut scent and the freshness of the verbena. water blossom would ne the scent I would like to try! I like the Coconut Lime Verbena. I'd like to try Coconut Lime Verbena! W would want to try the water blossoms. Coconut Lime Verbena for sure! I would like to try Yellow Raspberry & Black Sugar. Would like to try the water blossoms. I would like like to try the Coconut Lime Verbena. I like the coconut lime verbena wash. The Dial Deep Cleansing Hand Soap scent I would like to try first is the Coconut Lime Verbena. I most want to try the yellow raspberry and black sugar scent. I like the Yellow Raspberry & Black Sugar scent! I'd pick Coconut Lime Verbena. It sounds like a tropical drink. I want to try Coconut Lime Verbena. I'd love to try the Coconut Lime Verbena scent. I'd like to try the water blossoms scent. I would love to try the water blossoms scent. I want to try the coconut lime first. Coconut Lime Verbena because I love tropical scents! I'd like to try Coconut Lime. I'd like to try the coconut lime verbena. Definitely coconut lime...I love coconut. I would try the Coconut Lime Verbena first. Coconut Lime Verbena sounds like summer to me. I'd like to try it first. I would love to try the Coconut Lime Verbena. Himalayan Pink Salt & Water Lily sounds lovely. I'd like to try the Black Sugar scent. Coconut lime verbena sounds delicious! I would like to try the Yellow Raspberry & Black Sugar scent. The Yellow Raspberry & Black Sugar sounds wonderful. I would like to try the Yellow Raspberry & Black Sugar scent first. I would most love to try the Water Blossoms Dial hand soap first! I would llove to try the Yellow Raspberry and Black sugar scent. Thanks for the giveaway… we would like to try the Yellow Raspberry & Black Sugar scent ! Yellow Raspberry & Black Sugar.